We recently had a great story idea about featuring a list of some of the top truckstops across the country. After some quick researching on the web, one place kept coming up on the trucking forums: the Iowa 80, also known as the World’s Largest Truckstop. And since it’s not far from us here in NE Iowa, we thought it was fitting to feature this popular stop with a post of its own. 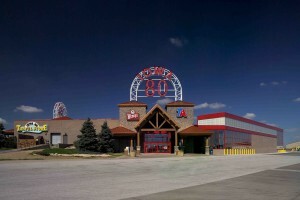 The sprawling Iowa 80 truckstop is tucked away in SE Iowa in the town of Walcott, just off of Interstate 80. Founded in 1964 by Bill Moon when he was employed with Standard Oil, Moon took over management of the property a year later for Amoco, and started adding amenities based on what he was hearing from truck-driving customers. Moon purchased the property from Amoco in 1984 and it’s continued to grow and change to meet the needs of truckers. The truck stop is still managed by the Moon family and now rivals a small town. 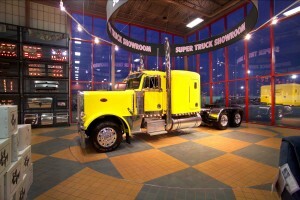 Along with the standard truckstop amenities like showers, coffee, and an ATM, other services include washers/dryers, a movie theater, church services, barber shop, DOT physician, chiropractor, dentist, truck wash, dog wash, a trucking museum, a super truck showroom, and a full service truck center. For visitors tired of standard convenience store food, there’s a full service restaurant that seats 300, as well Taco Bell, Pizza Hut, Caribou Coffee, Wendy’s, Dairy Queen, and a Blimpie sub shop on site. Since the first Jamboree in 1979, this event is the only of its kind to celebrate America’s truck drivers. Held over a weekend each July, attractions include nearly 200 exhibits, a Super Truck Beauty Contest, carnival games, live music, Trucker Olympics, an antique truck display, and fireworks. An amazing collection of more than 60 antique trucks and memorabilia is on display for visitors, which also features audio narratives available through free smart phone apps. The museum also has its own website, which features a list of trucks currently on display, offers information on field trips, an annual golf tournament, and more. This 30,000-square foot space houses everything from mud flaps and mirrors to lighting and locks. Sales experts are on hand to help with questions as well. A custom shop is available for embroidery, vinyl, and laser engraving for DOT standards, clothing, business cards, etc., making it truly a one-stop shop. Do you have a favorite truckstop? Drop us a message or reply below and let us know- it just may be featured on a future blog post!